Baker Library (Harvard Business School) - Covers most aspects of management including such specialties as accounting and control, agribusiness, banking, business and economic history, commerce, economic philosophy, finance, information technology, international business, management education, manufacturing, marketing, political economy, and transportation. Bancroft Library - University of California, Berkeley. One of the largest and most heavily used libraries of manuscripts, rare books, and unique materials in the United States, Bancroft supports major research and instructional activities and plays a leading role in the development of the University's research collections. Barnett-Briggs Medical Library - Located at San Francisco General Hospital. Library collection, database and web resources, books and journals. Beinecke Rare Book & Manuscript Library - Yale University's principal repository for literary papers and for early manuscripts and rare books in the fields of literature, theology, history, and the natural sciences. In addition to its general collection of rare books and manuscripts, the library houses the Yale Collection of American Literature, the Yale Collection of German Literature, the Yale Collection of Western Americana, and the Osborn Collection. The Beinecke collections afford opportunities for interdisciplinary research in such fields as medieval, renaissance, and eighteenth-century studies, art history, photography, American studies, the history of printing, and modernism in art and literature. Books and manuscripts at Yale have been extensively described since 1926 in the Yale University Library Gazette," available in many libraries. BFI Reuben Library - Provides access to a large collection of documentation and information on film and television. As a major national research collection, the main priority is to provide comprehensive coverage of British film and television, but the collection itself is international in scope. Bibliotheca Alexandrina (Egypt) - Composed of the Main Library, considered the largest reading room of the world, and a number of specialized libraries: The Children's Library, the Young People's Library and the Taha Hussein Library for the Blind and Visually Impaired serve the specific needs of their users. The special collections of the library include the Arts & Multimedia Library, the Manuscript Reading Room, the Microfilm Reading Room, the Rare Books & Special Collections Reading Room, the Nobel Section, and the Shadi Abdel Salam Collection. Bibliothèque nationale de France (BnF) - The National Library of France, located in Paris. It is intended to be the repository of all that is published in France. Also see Wikipedia article. Bodleian Library (UK) - The main research library of the University of Oxford. British Library - Over 13 million books, 920,000 journal and newspaper titles, 57 million patents, 3 million sound recordings, and more. Also see Search Tips. Bureau of Prisons (BOP) Library - The BOP Library has nearly 5,000 books, Government documents, statistical and organizational publications covering corrections and criminal justice topics. Cal Maritime Library - One of the few maritime research libraries in the world. The library holds over 35,000 books and over 270 magazine and journal titles. It also provides over 12,000 online magazine and journal titles as well as several thousand e-books. Located in Vallejo, California. California Digital Library (CDL) - University of California's "library without walls " includes Online Archive of California (OAC), Counting California, Melvyl Catalog, California Periodicals Database, electronic journals, specialized and reference resources. California State Library - The State Library, under the direction and control of the State Librarian, an appointee of the Governor, has responsibility to collect, preserve, generate and disseminate a wide array of information; to serve as the central reference and research library for state government and the Legislature; to advise, consult with, and provide technical assistance to and outreach programs for California's public libraries. Chicago Public Library - The 79 locations of the Library are a source of books, periodicals, newspapers and information in multiple languages. Digital Public Library of America (DPLA) - A project aimed at bringing about a large-scale public digital library. It was launched by Harvard University's Berkman Center for Internet & Society in 2010, with financial support from the Alfred P. Sloan Foundation and several other funders. The DPLA offers a single point of access to millions of items-photographs, manuscripts, books, sounds, moving images, and more-from libraries, archives, and museums around the United States. ETH Zurich - ETH Library, established in 1855, is the largest public natural scientific and technical library in Switzerland and has a major influence on technical developments in Swiss libraries in general. Search the NEBIS Library Catalogue, Research Collection, E-Periodica, ETH Data Archive, E-Pics Image Catalogues, Material-Archiv, Graphische Sammlung and Archival Databases. European Library, The - A free service that offers access to the resources of the 47 national libraries of Europe in 20 languages. Resources can be both digital or bibliographical (books, posters, maps, sound recordings, videos, etc.). Currently The European Library gives access to 150 million entries across Europe. Folger Shakespeare Library - Located on Capitol Hill in Washington, D.C. and home to the world's largest collection of Shakespeare materials and to major collections of other rare Renaissance books, manuscripts, and works of art. Glasgow University Library - Well designed site, excellent online resources, subject backgrounders, special collections, library guides. H.M. Fishbon Memorial Library, UCSF Medical Center at Mount Zion - Clinical and medical research library located at the University of California, San Francisco Medical Center at Mount Zion (Mount Zion Hospital). Hargrett Rare Book & Manuscript Library (University of Georgia) - Consists of the Rare Book and Manuscript Library, the Georgiana Collection, the University of Georgia Archives and Records Management. The Library serves the University scholarly community, as well as scholars and researches worldwide. Subject interests include Georgia, Book Arts, Theater, Music, History, Literature, Journalism and Genealogy. Harold B. Lee Library (Brigham Young University) - Preserves and houses materials requiring regulation. Because of their uniqueness, value, or fragility, these materials are given great care to protect them from damage or theft and to ensure their proper long-term use. Harry S. Truman Library & Museum - Presidential museum and library. Harvard Business School: Baker Library - Baker Library collects books, pamphlets, journals, newspapers, and magazines on all aspects of management plus such specialties as accounting and control, agribusiness, banking, business and economic history, finance, information technology, international business, marketing, and management education. Harvard University Libraries - HOLLIS, the Harvard OnLine Library Information System. Heriot-Watt University Edinburgh: Library - The lead partner in the development and delivery of EEVL, the Internet guide to engineering, mathematics and computing. Horn Library Babson College - The Navigator at Horn Library is the library's guide to help you select and use the best Internet, Babson Desktop and print information resources for your research project. Houghton Library - The primary repository for Harvard's rare books and manuscripts. The collections of the Houghton Library focus on the study of Western civilization. Materials relating to American, Continental, and English history and literature comprise the bulk of these collections and include special concentrations in printing, graphic arts, and the theatre. The collections encompass diverse holdings such as ostraca, daguerreotypes, and the working papers of living novelists and poets. Houghton Library regularly exhibits highlights from its collections in the Edison and Newman Room. 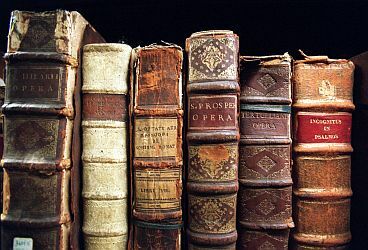 These often include the personal effects, notes, books, and other objects of interest from authors such as Copernicus, Emily Dickinson, John Keats, Edward Lear, Dante, Tennessee Williams, Goethe, Cervantes, and Lewis Carroll. Also see the Houghton Library Blog. Library and Archives Canada - Collects and preserves Canada's documentary heritage, and makes it accessible to all Canadians. This heritage includes publications, archival records, sound and audio-visual materials, photographs, artworks, and electronic documents such as websites. Library of Congress - Catalogs, collections, research services, publications, and tools for information professionals. Library of Congress Authorities - Browse and view authority headings for Subject, Name, Title and Name/Title combinations; and download authority records in MARC format for use in a local library system. Wise Guide - A portal designed to introduce you to resources available from the nation's library. Library of the General Society of Mechanics & Trademen of the City of New York - The Library has more than 120,000 volumes of current fiction, non-fiction, trade, and technical-related research materials. The collections represent the importance placed on a broad education and illustrate urban work history. As the second oldest continuously operating library in New York City, the wealth of older books makes the library an excellent research facility. Lilly Library - Duke University research collections for the fine arts, decorative arts, and performing arts. Lilly Library, The - The rare books, manuscripts, and special collections library of the Indiana University Libraries, Bloomington. Los Angeles Public Library - In addition to serving its own community with a central library, more than 67 branch libraries and several bookmobiles, the Los Angeles Public Library is a major resource for individuals, libraries, and other organizations throughout the U.S.
MaineCat - Combines and links nearly 100 library collections contained in 10 large online library systems. A single search scans more than 4.6 million unique titles and nearly 8.9 million items. Memorial Universty Libraries - Memorial University of Newfoundland and Labrador, Canada. Michigan Electronic Library (MEL), Library of Michigan - MEL's 'virtual library' is selected and evaluated by librarians and is designed to be a comprehensive electronic information tool. Mina Rees Library - City University of New York (CUNY). MIT Libraries - Massachusetts Institute of Technology. Morgan Library & Museum - Began as the private library of financier Pierpont Morgan (1837-1913). Today, it is a global institution focused on the European and American traditions, the Morgan houses one of the world's foremost collections of manuscripts, rare books, music, drawings, and ancient and other works of art. National Library of Australia - A comprehensive collection of Australian library material and international documentary resources. National Library of Canada - Collections focus primarily on Canadiana, works in all subjects written by, about or of interest to Canadians, published in Canada or abroad. Also see the National Library of Canada Electronic Collection - books and periodicals published online. National Library of Israel - The largest collection of publications within Israel is accessible to the public free of charge at the National Library with over 5 million volumes of books, manuscripts, periodicals, archives, maps, photographs, and audio recordings. National Library of Wales (NLW)/Llyfrgell Genedlaethol Cymru (LLGC) - Since 1911 NLW it has enjoyed the right to collect, free of charge, a copy of every printed work published in Britain and Ireland. In addition, it has a huge collection of works about Wales and other Celtic countries: books and pamphlets, magazines and newspapers, microforms, ephemera, and a wealth of electronic material. National Safety Council Library - Safety issues organized by topic. New York University Libraries - See complete listing of NYU libraries as well as other affiliated libraries here. BobCat is the catalog of NYU Libraries. Newberry Library - An independent research library concentrating in the humanities with an active educational and cultural presence in Chicago, Illinois. Niebyl-Proctor Marxist Library - Provides an alternative source of information for anyone interested in the progressive literature. Online Computer Library Center, Inc. (OCLC) - A nonprofit, membership, library computer service and research organization dedicated to the public purposes of furthering access to the world's information and reducing information costs. Presidential Libraries - The Presidential Library system is composed of thirteen Presidential Libraries. These facilities are overseen by the Office of Presidential Libraries, in the National Archives and Records Administration. Reuther Library - Home to the Archives of Labor and Urban Affairs and the Wayne State University Archives. It collects, preserves and provides access to the heritage of the American labor movement and related reform movements of the twentieth century. The collection also includes urban affairs, with particular focus on the history of metropolitan Detroit. Seeley G. Mudd Manuscript Library - A division of the Department of Rare Books and Special Collections, is a state-of-the-art repository constructed in 1976 to house the Princeton University Archives and a highly regarded collection of 20th-century public policy papers. Smithsonian Institution Libraries -1.5 million printed books, manuscripts, periodicals, exhibition catalogs, professional society publications, and electronic versions of rare books and exhibitions. State Library of Victoria - The major reference and research library in Victoria, Australia, responsible for collecting and preserving Victoria's documentary heritage and making it available online, and through a range of services and programs. Walter P. Reuther Library - The Reuther is home to the Archives of Labor and Urban Affairs and the Wayne State University Archives. It collects, preserves and provides access to the heritage of the American labor movement and related reform movements of the twentieth century. The collection also includes urban affairs, with particular focus on the history of metropolitan Detroit. This webpage last updated on Saturday, October 20, 2018 8:40 AM.